SoftPlanet makes it possible for everyone to get free Norman Security Suite download directly from our servers. There is no registration needed for downloading. One of the things that is reminded daily by the integrated security shield of Microsoft Windows is to install an antivirus program if you don't have one. This may be annoying but only underlines the importance of antivirus applications in the contemporary world. You can't use a computer without such a program, because there are threats that lurk on every turn. 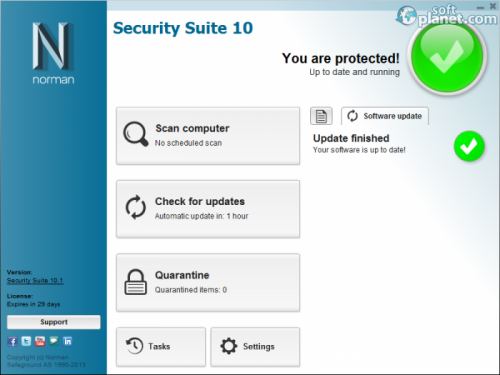 One of the programs that you can use for your protection is Norman Security Suite. It offers to make the best defense for your computer, so that you could feel safe about your personal information and about your data. The only disadvantage of this app is that you can use it only for 30 days for free and after that you have to pay EUR 39.95 for 1 year for 3 computers. Norman Security Suite has three scanning modes that let you perform the main task of the app. With it you can make a Full scan, which in our case was a scan of 97,044 files and the program didn't find any viruses in our operating system. If you need to make a quick check the application can also make a Quick Scan. When we tried it, this type of scan checked 6,766 files – the most important ones in our computer. Again it did not find any malware in them. There's also the option of a custom scan, which, as you can guess, can perform a scan on a folder or a drive of your choosing. Norman Security Suite has a user friendly interface that will help you to perform the most important functions of the app with ease. From the main screen of the program you have access to the scan option, to the updates or the quarantine with a click of a button. There are also the tasks that can be set as a queue and also the settings button that lets you customize the application in some ways. Another good side of the interface of the app is that you can use it in several languages, including German, Danish, English, Spanish, French, Italian, Dutch, Norwegian, Polish, Portuguese, Slovenian, Finnish, Swedish, Turkish, Czech and Chinese. All the main functions of the app worked nicely and Norman Security Suite didn't burden our computer a lot during the scanning process. It may seem that the app has few options, but if you want more you can add them during the complicated installation process. During it you can add additional components that will help you protect your PC in new ways, but they will also give you some extra options. 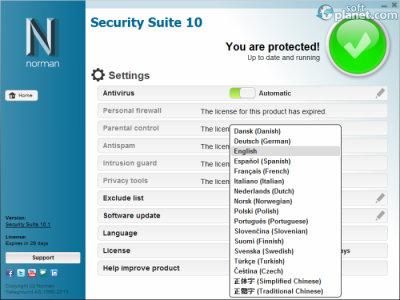 From there you can add Personal Firewall, Privacy Tools, Intrusion Guard, Parental Control and Anti-spam utility. 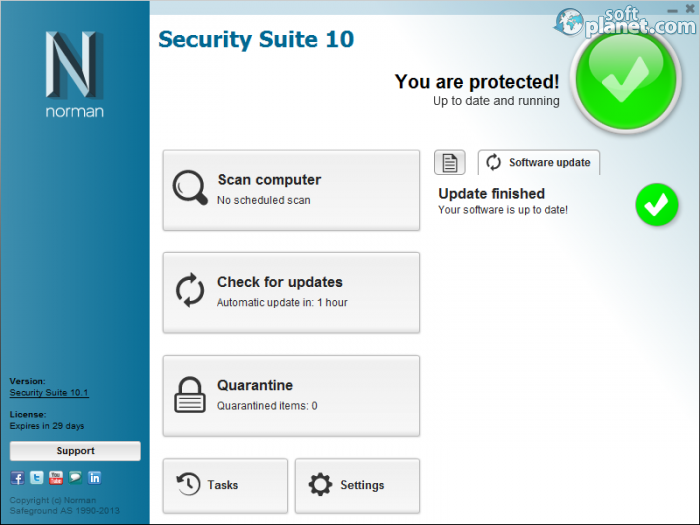 Norman Security Suite is a capable antivirus program that is light on resources and also quite user friendly. There are some problems with it, including the complicated installation process, but the most important one is usual for capable apps like this one. It is a paid program after the trial version so if you want to use it for more than 30 days then you have to buy it. Norman Security Suite is VIRUS-FREE! Our security scan shows that Norman Security Suite is clean from viruses. The current version of Norman Security Suite has been scanned by our system, which contains 46 different anti-virus algorithms. That ensures that Norman Security Suite 10.1 is 100% safe for your computer.